Physical characteristics: Black terns have black heads, necks, and breasts. Their backs and bellies are dark gray in color. Juveniles and nonbreeding adults are pale gray on the back and white on the belly and head, with a dark patch on the side of the breast. Geographic range: Black terns are found in temperate North America, Europe, and Eastern Asia during the breeding season. They spend the winter in Central and South America and in Africa. 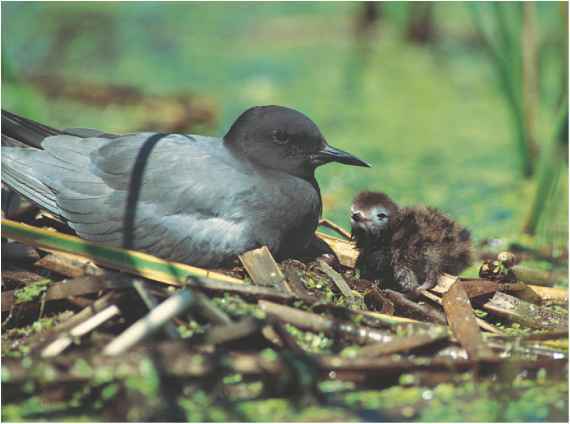 Habitat: Black terns breed in inland habitats such as ponds, lakes, and marshes. In the winter, they occupy seashore and coastal wetland habitats. Diet: Black terns eat aquatic insects, snails, small fish, tadpoles, and frogs. floating vegetation. 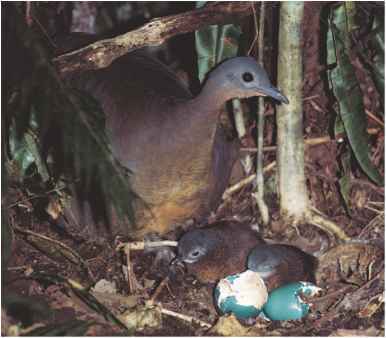 The female lays two to three eggs at a time, and these hatch after twenty to twenty-three days. Chicks leave the nest after twenty-five days. Black terns and people: The preferred nesting areas of black terns include the small lakes or marshes that are often drained by humans. Conservation status: Black terns are not considered threatened. However, some populations have declined due to destruction of wetland habitats, pesticides, and competition with human-introduced fish for food. "Family Laridae (Gulls and Terns)." Animal Diversity Web, The University of Michigan Museum of Zoology. http://animaldiversity.ummz.umich. edu/site/accounts/classification/Laridae.html#Laridae (accessed on June 1, 2004). "Family Rynchopidae (Skimmers)." Animal Diversity Web, The University of Michigan Museum of Zoology. http://animaldiversity.ummz.umich. edu/site/accounts/classification/Rynchopidae.html#Rynchopidae (accessed on June 1, 2004). "Laridae (Gulls)." The Internet Bird Collection. http://www.hbw.com/ibc/ phtml/familia.phtml?idFamilia=66 (accessed on June 1, 2004). "Rynchopidae (Skimmers)." The Internet Bird Collection. http://www.hbw.com/ibc/phtml/familia.phtml?idFamilia=68 (accessed on June 1, 2004). "Sternidae (Terns)." The Internet Bird Collection. http://www.hbw.com/ ibc/phtml/familia.phtml?idFamilia=67 (accessed on June 1, 2004).